Proper hand washing skills are very essential to prevent transmission of infection. Hand washing removes the hidden germs and helps in putting off contamination. Before practicing any other skill, you first need to wash your hands. In this article, we have included the step-wise procedure to perform this skill and expert’s advice that would help you a lot in scoring good marks. Follow the below given steps, while demonstrating this skill. Step 1- Remove all the accessories, you are wearing on your hands. Take out all the jewelry (like watch, bracelet and ring) that you are dangling on your hands, before you begin washing. Remember, you nails should not be painted. Remove fake nails. Open the tap. Ensure that water is not so hot that it may burn your skin. Leave the water running. Wet your hands at least up to the wrist. Apply enough soap, cleansing liquid or foam to the hands. Rub them together for at least 15-20 seconds. Firmly press the hands against each other, so as to remove the germs hiding beneath or around the fingernails. Thoroughly wash all surfaces of the hands, at least up to the wrist. During rinsing, keep your hands in the downward direction i.e. in a position lower than your elbow. Avoid touching the hands with sink or other unclean surfaces. If you mistakenly touch the sink, you will have to wash your hands again by repeating the same procedure. Dry your hands on warm air drier or with clean disposable towel. Turn off tap with towel. After using the towel, discard it appropriately. Don’t use it again, as it may have germs. Wash your hands for at least one minute, whenever you touch vomit, mucous, blood, urine or any other body fluids. 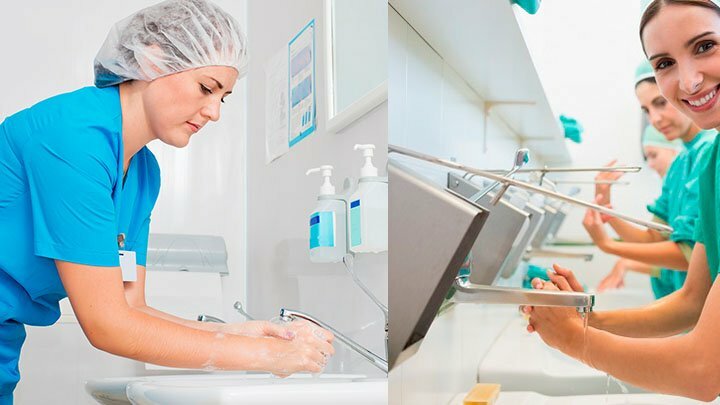 Wash your hands several times a day, while working directly with patients. Rinse them every time, you fed the patients, touch their wounds or linens, before entering or leaving the patient’s room, or before and after carrying any medical procedure on them. You are required to wash your hands, even if you wear the gloves. Tip- Stood in such a way that your clothes don’t come in contact with the sink. Whether you adjust the temperature to warm? Tip- Open the tap. Adjust the temperature of the water to warm. Leave the water running. How do you wet your hands? Tip- Wet your hands up to the wrist. Remember, the level of your hands should be lower than your elbow. How you apply cleansing agent or soap? Tip- Use enough soap or cleansing agent on your hands. For how long you wash your hands? Tip- Wash your hands, pressing against each other for at least 15-20 seconds. How you rinse your hands? Tip- Wash your hands up to the wrist, under the running water, with your fingertips pointing downwards. In which manner, you dry your hands? Tip- Dry your hands from fingertips to wrist, using a paper towel. How you turn off the water? Tip- For turning off the water, use dry paper towel. Whether you dispose the towels? Tip- Dispose all the used paper towels, appropriately. Most of the certified nursing assistants forgot to wash their hands in hurry. It’s completely wrong. It’s a very essential task, which should never be forgotten. Pay attention to the clinical session of your training program. Try to note every small detail. Even if you are asked to perform any other skill, you should begin with hand washing. A single mistake in hand washing may lead to failure in the exam and you will have to retake it later. This video will clarify you the procedure of hand washing in a perfect manner. Watch it.